🌟 OK, OK. I may have exaggerated a lot here but what I am trying to say is that this is a Middle Grade book and we should approach it as one. I don’t deny that I wish it was bigger, with more action and creepier. But that’s just how MG books are. I think someone who reads a lot of MG will be able to judge it better than most of us. Let’s be honest, we all know V.E. Schwab and how she is a great writer and always comes up with awesome twists and ideas. I think if this was an adult book, she would have done an outstanding job. 🌟 I saw some negative reviews (all from adult readers) which actually made me go into this with lower expectations. And I ended up enjoying it more than I thought I would. 🌟 Story wise, the idea was great -as usual- and the story got interesting more and more (it was really good from the ghost hunters part and after that). But I felt the ending was a bit rushed and it could have been a bit slower. 🌟 The writing felt MG to me (and that’s how it should be, Duh!) And tbh, that fascinated me, Victoria can write MG, YA and adults book and change the voice and settings accordingly! There were many HP references that warmed my heart but I am not sure if MG readers would feel the same about it. 🌟 Summary: I like the characters and their development, I like almost everything about this. If you are an adult reading this don’t expect it to be the next A darker shade of magic because it is not and nor it is supposed to be so. As a MG book, I give it 4 stars. As an adult reader, I give it 3 stars. 🌟 Prescription: For MG readers and adults who enjoy the MG genre. Otherwise, I recommend going into this objectively or skipping it altogether! 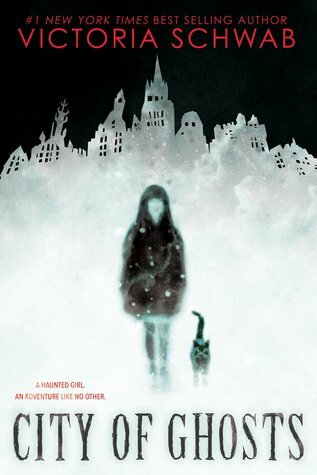 Tags: Book Reviews, Books, city of ghosts, creepy, fanatsy, ghosts, ghosts hunter, middle grade, Victoria Schwab. Exactly! Glad someone understands where I am coming from! Thank you for your prescription doc! It’s totally for me!!! I’m glad you enjoyed the book, this has been on my TBR from the very first time and I can’t wait to read it!!! I had you in mind while I wrote that someone who is an expert at MG should read this! Oh my, I wouldn’t call myself an expert but I do love MG more than anything! Awesome review, as always! I really like how you broke down your rating. I don’t read a lot of MG and yours is the first review I have seen that really addresses that and helps to reset the expectations accordingly. I have seen all of Victoria fans reading this but the ratings haven't been the best so I thought we were not doing her just by approaching it as her other books!